Blossom Pincushion. The other side is the reverse color scheme, with the background dark and the flower light. Mary Jane Mucklestone is a wonderful knitter and designer who has been greatly influenced by Scandinavian knitting, which is two-color stranded knitting. Mary Jane grew up in Seattle, where there’s a large Scandinavian community, as well as a vibrant community of knitters. Seattle even hosts a Nordic Knitting Conference, and it’s amazing. Mary Jane’s new book, 150 Scandinavian Motifs: The Knitter’s Directory, is a collection of favorite motifs that you can incorporate into your knitting. 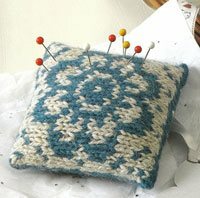 You can also use a single motif to make a little treasure like the darling pincushion shown at right. The book also provides a nice section on stranded knitting techniques, in which I learned about something that’s been mystifying me for years: yarn dominance. This is a subtle but important issue if you’re counting on colors looking like you want them to look, and I’ve never been totally clear on how to manage it. In stranded knitting, one yarn will appear slightly more dominant than the other. Yarn dominance occurs because one yarn’s strand travels slightly farther than the other, making it slightly tighter, causing it to recede, and be less dominant. The yarn traveling the shortest distance is the dominant yarn. Another way of putting it is that the yarn that comes from below will dominate, while the yarn from above makes a slightly smaller stitch.Usually the pattern yarn is held to the left of the background yarn, making the pattern color dominant, but there are slight differences in individual technique.The most important thing is to be consistent in holding your yarn. Assign one position to the pattern color and one to the background color; always keep them in the same position while knitting your piece. On the top swatch, the gray stitches are larger; on the bottom swatch, the white stitches are larger. When we look at the wrong side, on the top swatch the gray strands are beneath the cream strands and on the bottom swatch, the cream strands are beneath the gray strands. Mary Jane spelled it out for me: the longer float pulls the stitches in, making them recede into the fabric, which makes perfect sense. The photos really drive the point home, too, and show how important it is to keep one yarn consistently above the other yarn. This is just one of the things you’ll learn from 150 Scandinavian Motifs. Get your copy today and start your Scandinavian knitting adventure! P.S. Have you knitted a Scandinavian sweater? Leave a comment below and tell us about it!